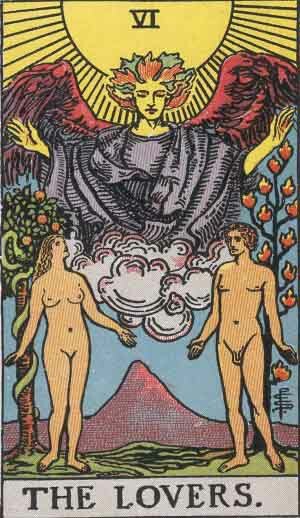 The Major Arcana cards represent significant lessons, trends and influences of a persistent nature. 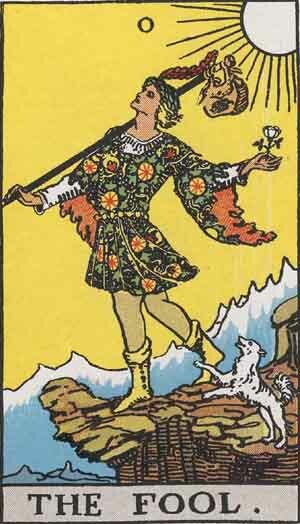 Meanings of the Fool, Magician, High Priestess, Empress, Emperor, Hierophant, Lovers, Chariot, Strength, Hermit and Wheel of Fortune cards may be found on this page. Click on the card to view a larger image. The Fool is a child sampling life. Naive. Spontaneous. Endearing. Exploring where his whims take him. Anything is possible. But his little dog may be warning him not to step too close to the edge of the cliff. The Fool may be studying the stars when he should be looking where his next step will land. He may be a likely victim of trickery and deception. An easy target for bullying or usery. Traditionally, also a suggestion of careless and excessive sexuality. 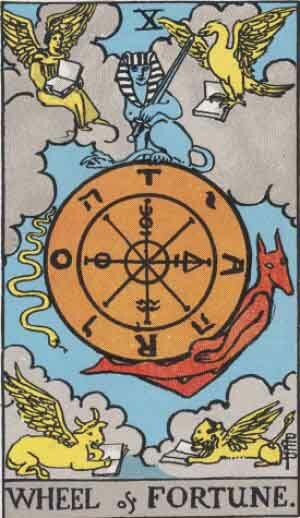 This card more than any other represents the subject, experiencing the influences of the diverse cast of characters in the Tarot deck. Foremost, the victim of recklessness. Reversed, the Fool falls from the cliff. After his painful landing, he may shy away from risk taking, become suspicious or fearful. But, sometimes read as the exaggeration of the negative aspects of the upright position. Even greater excesses or irresponsibilty. Foolish choices. In some contexts, also seen as a call to accept responsibility and quit acting the Fool. Positive transformation. Progress. Understanding that which is already known. Appreciating that which is already available. Clever. Focused. Diplomatic. Interesting. Note the symbol of infinity representing the heights of achievement possible. 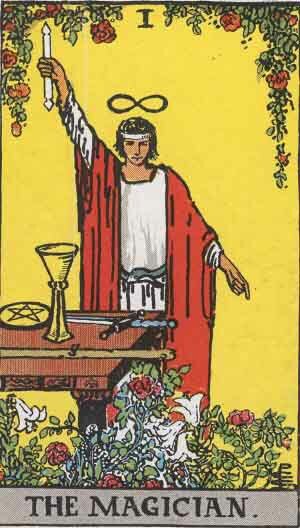 The Magician is the facilitator of the Tarot deck. Enabling the subject to utilize their talents and abilities to better advantage. A salesman who sells you on yourself. At his worst, a bit conniving and manipulative. In readings where the Magician represents the subject, heightened communications skills and persuasiveness are also suggested. When representing another, pay close attention. Remember that although the Magician is usually an agent of progress and growth, he is also capable of trickery and deception. Low self esteem. Problems communicating. Options are lacking. Progress is difficult, and opportunities overlooked. Sometimes overconfidence or poor planning that obscure understanding. Inability to utilize the tools available. Reversed, the persuasive powers of the Magician may result in self deception. Traditionally, a con man, user, phony. Also, take care to protect against head injuries. Surprising revelations may by coming. 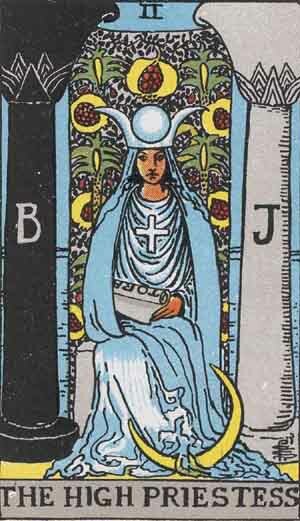 The High Priestess card represents illumination, knowledge and truth. She is eminently feminine, mysterious, secretive and intuitive. Moody and aloof. Knowing all, but expressing her secrets by measure, or through symbolism. Yet she is a powerful advisor. A well of knowledge, but only a cup at a time is dispensed. This card may often represent the subject, if female, or the object of the subject’s desire, if male. Also, perhaps a suggestion for introspection or meditation. Traditionally, she represents knowledge, modesty and discretion. Passion. Indiscretion. Immodesty. Promiscuity. Seduction. Betrayal. Revealing secrets to cause embarassment and hurt, rather than to share knowledge. Selfishness or shallowness. 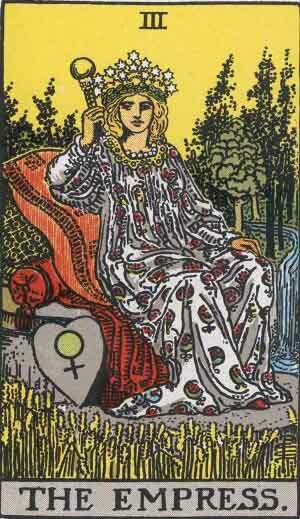 The High Priestess card reversed may also be a warning to pay heed to feminine health issues. Birth. Growth. Development. Nurturing. The Empress is a good mother. Fruitful, benevolent, loving and caring. A person of station deserving of respect. 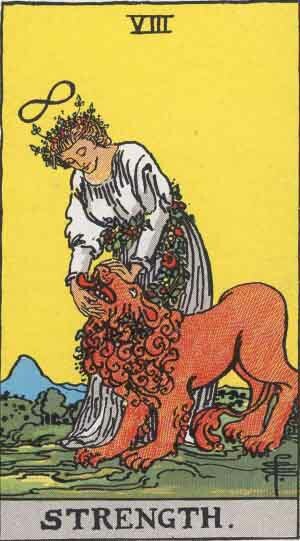 When seeking answers about one’s self, the card may indicate motherly worries about people or projects. It may raise the question of too much mothering or overprotectiveness. It may also be a reminder to the seeker that patience and persistence are necessary when nurturing growth. Traditionally, fertility, wealth, marriage, a female family member. The opposite of nurturing and caring. Disregard for others. Abandonment of those who need care. Perhaps an indication to learn to be a better nurturer or caretaker. Traditionally, infertility, poverty, lethargy, infidelity. The Emperor represents power, stability and leadership. Fatherhood. A person to be counted upon, trusted and respected. The character and will to keep the ship on course. 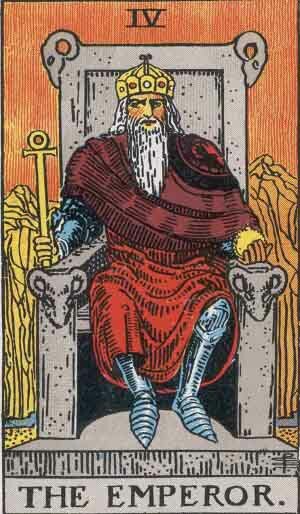 When seeking answers about one’s self, the card might also indicate that introspection is suggested, and decisions may need to be made on whether the benefits of leadership are worth the sacrifices. 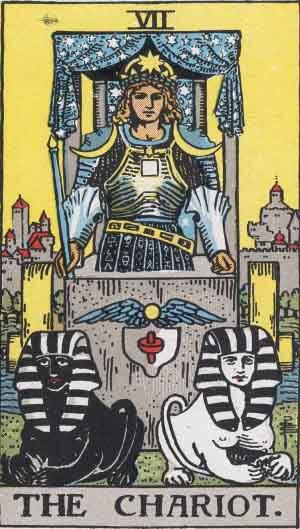 Reversed, the Emperor represents immature and controlling behavior. Demand for power, but lack of character. This may also negatively affect a family or organization who rely on the Emperor’s leadership. If the Emperor is dethroned, the empire will be affected. A teacher and a counselor. A good and benevolent influence. Helping the subject understand the correct path. A priest, rabbi, or perhaps a guru. One who enlightens. 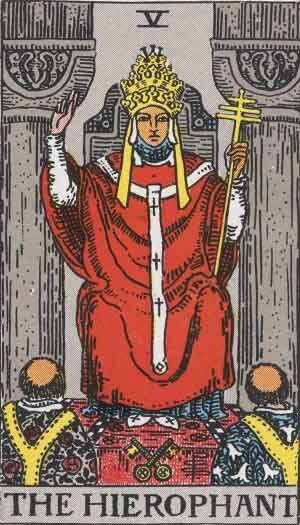 The Hierophant represents learning and living by the rules of society and of spirituality. But in some contexts, inflexible and unyielding. Unwilling to accept deviation from the conventional. Traditionally, merciful, forgiving, kind, respectable, dutiful. This card also represents joining and accepting. Sometimes interpreted to suggest marriage. Rejection of traditional morals. A renegade. Anti-establishment. Breaking the rules. 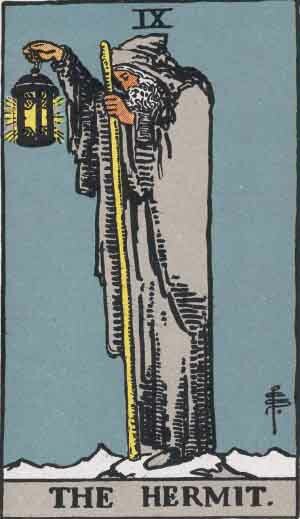 Conversely, the inverted card often is thought to represent excessive stubbornness, stodginess, inflexibility or conformity. My way or the highway. In certain contexts, could suggest divorce. Also, perhaps a warning of respiratory infections such as cold and flu. Following the heart. Trust. Relationship. Responsibility. Commitment. Also partnership and cooperation. The Lovers may be an indicator of a love affair, but more so has to do with making good choices. Recognize the difference between love and infatuation. Relationship problems. It could be Romeo and Juliet, passionate lovers kept apart by their feuding families. It could be discontent resulting from a poorly considered marriage. The unhappy consequences of bad choices. In some contexts the harbinger of breakups or divorce. Triumph. Mastery. But not easy and swift. Achieved through careful planning, hard work, force of will and foremost by harnessing disparate forces to work in unison. Self control, confidence, commitment, effort and focus that produce success. Overcoming obstacles. Also, often relates to travel. A trip or a move may be coming soon. Traditionally, journeys, exploration, conquest, control. Difficulty or failure coordinating disparate forces. Lack of control. Lashing out. Rashness. Indecision. Moving in circles. Sometimes interpreted as a warning of stress related illness, such as ulcers. Also possibly vehicle or travel problems. Traditionally, accidents, defeats, delays. Mastery, focused inward. Force of will. Self control. The courage, confidence and persistence to follow through to the successful conclusion, in spite of difficulties. Harnessing one’s own talents and strengths. May represent providing a calming influence on others. Traditionally, fortitude, patience, perseverance, endurance. Sometimes, love of animals, particularly cats. Not in control. Unable to harness inner forces. Extremes of anger or timidity. Avoidance. Cowardice. Unable to break bad habits or overcome addictions. Traditionally, anger, tyranny, weakness, cruelty, impatience. Sometimes a warning of health problems related to anger and agitation, such as high blood pressure. Introspection. Spirituality. Looking objectively at the world around. Learning for the sake of learning. Stepping back from the fast pace of life for a while to take stock of where you are. It may be time to consider the lessons of the past. Increasing knowledge for the sake of doing so. A need for space and time alone. Possibly a wise confidant or tutor. A beacon of knowledge. Traditionally, wisdom, reserve, meditation, secrecy. Antisocial. Withdrawn. Senile. Lost in the dark. Possibly a victim of betrayal. Perhaps fears of growing old or being alone. This could be a warning to think more objectively. Also, beware of false or ignorant teachings. Traditionally, reclusiveness, isolation, lonliness. Be conscious of diseases related to aging, such as arthritis or hearing loss. Unexpected good luck. Raises. Promotions. Prosperity may be coming your way. Good news about health issues. As always, good luck becomes better for the prepared and the proactive, but this card also represents providence. Traditionally, fortune, good health, advancement. Ups and downs. Instability. Unpredictability. Apparent good fortune may not turn out to be so good after all. After finally being promoted to the white collar job, white collar jobs are downsized. Traditionally, negligence, inconsistency, speculation, cruel fate. Possibly might suggest fluctuating health issues such as allergies or weight gain. Copyright © 2012 free-tarot-card-readings.net All rights reserved.